Eggs, rare-breed Shetland Hoggit and Golden Guernsey goat meat & cheese, reared using organic principles and feed on the Somerset and Devon border near Holcombe Rogus, Greenham, Stawley, Wellington, Tiverton, Bampton, Wiveliscombe, Hemyock, Uffculme and Sampford Peverell. Steepholding is a traditional mixed farm on a very small scale. 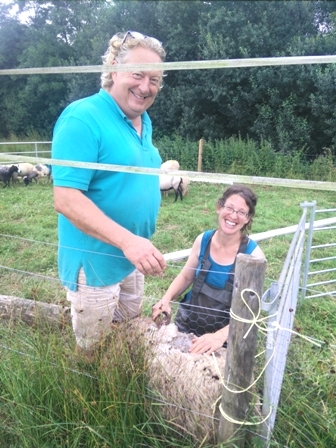 We produce Eggs, rare-breed Shetland Hoggit and Golden Guernsey goat meat & cheese, reared using organic principles and feed on the Somerset and Devon border between Holcombe Rogus & Greenham. Raising livestock here enables us to ensure that our animals have good lives and that our food tastes delicious. We supply eggs & meat to our veg box customers, and other local people interested in high quality, ethically reared rare-breed meat. We rear Shetland sheep and Golden Guernsey goats to help us manage our land by grazing and browsing. Our animals have access to the land all year round. Our kid goats and lambs are reared by their mums and stay with their mums until they are ready for weaning. Like all rare-breeds they are slowing growing but produce incredibly tasty joints. Our chickens free range in the true sense - with access to all the things that make chickens happy, fresh mixed pasture, lots of bugs to scratch up, varied garden waste and organic feed. One customer ran a test to see if our eggs really were better and said yes, hands down, in a pan with shop bought organic eggs ours had sunnier yolks and better flavour. Our Golden Guernsay goats milk is rich and creamy but mild on goaty flavour. It is made into beautiful fresh soft Chevre, ideal for eating fresh, alone or as an accompaniment to many dishes and for cooking. .